(Nanowerk News) A*STAR scientists have drawn on nature for a breakthrough that significantly enhances the electrochemical performance of lithium-ion batteries. 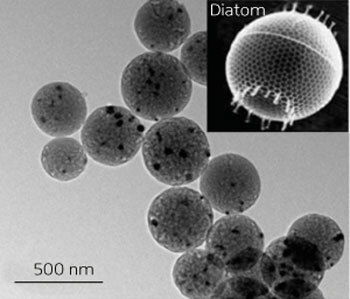 The researchers have developed hierarchical porous carbon spheres to be used as anodes after being inspired by the templated formation of unicellular algae or ‘diatoms’ ("Bioinspired Synthesis of Hierarchical Porous Graphitic Carbon Spheres with Outstanding High-Rate Performance in Lithium-Ion Batteries"). This natural phenomenon inspired Li and colleagues to develop biomimetic strategies based on self-assembled molecular templates to produce hierarchical carbon materials for use as anodic components of batteries. These materials contain mesopores, which form an interconnected network of channels within the carbon spheres, and have a microporous surface (see image). These three-dimensional features promote ion transport and high storage capacity within the carbon spheres. Li and the team used organic macromolecules, an aggregate of polymers and cobalt-containing molecules, as templates to make the interconnected mesopores — in a similar way that diatoms create their siliceous structure. The carbon scaffold of the spheres is derived from rings of sugar molecules, which thread on to the pendant polymer chains and form ‘soft’ carbon spheres after hydrothermal treatment. Pyrolysis causes a cobalt species to catalyze the graphitization process, creating the ‘hard’ carbon spheres. If urea is added before pyrolysis, nitrogen-doped graphitic carbon spheres are made. “The carbon spheres can only be prepared on a laboratory scale, however, we are optimizing the synthetic conditions to scale up fabrication,” says Li. Next, Li and co-workers tested the carbon spheres as anodes in lithium-ion batteries. The batteries showed high reversible capacity, good cycling stability and outstanding high-rate performance. Even when the current density is increased 600-fold, 57 per cent of the original capacity is retained. The nitrogen-doped carbon spheres have a higher reversible capacity because of more facile transport of ions and electrons within the doped carbon spheres. “These results are among the best output to date compared with pure carbon materials,” says Li. “We envisage that batteries composed of these anode materials could be charged faster than those fabricated using conventional carbon materials,” he adds. The next stage of the research is to extend the application of these materials to other energy storage or conversion systems, and other electrochemical applications, such as electrocatalysis.